Thomas Hart Benton, First Crop. Gouache on paper, 21 x 29 3/4 inches. Collection of the Nasher Museum of Art at Duke University. What types of patterns were used? Why do the costumes have patches? I can make a paper textile design for a silhouette person. I can then assemble my design with others in my class to create a “parade”. Read Jonkonnu , by Amy Littlesugar and Ian Schoenherr (15 min.). If desired, start by reading several pages, summarizing the rest to spark a class discussion about prejudice but how Winslow Homer did not waiver. Then the last two pages can be read to end the story. Now discuss the vocabulary (5 min.) to review what they have learned. Demonstrate how to draw with yellow chalk a simple shirt outline (basic T-shirt design or with collar) and pant/Capri outline. Divide the top and pants into sections. A different pattern is to be created in each section with colored materials. Patches, pockets in odd places are then added with lines drawn like “stitches” around each section and patch as details. Have students gather supplies and begin their own outlines of a shirt and pants. Once they have divided the top and pants into sections, they begin to fill in a section with a pattern of their choosing. Remind them to write their names on the back and save for next lesson. Demonstrate how to cut the outline of the shirt and pants, and draw “stitches” to add details (2 min.). Have students continue their work. They will create bold patterns in each section; cut out the outline of the shirt and pants; use scraps of negative space paper to create pockets and patches, drawing “stitches” around as if sewn; and add wallpaper scraps and fabric scraps to make the costumes unusual and unique. Show how to cut out all appendages and glue them to the back of costume pieces with the chalk edge not showing extending out from shirt neck, sleeves, and pants. Use odd fabric scraps to fashion a turban, scarf, or hat for the person created. While students are independently working, add details to the kraft paper to depict a road, houses, and trees. The setting may be from the Caribbean, or from the South (U.S.) drawn in marker. Students create their silhouette as instructed and glue parts together. Then, they assemble their work with others on the kraft paper with smaller figures higher on the composition, and larger figures overlapping other figures lower on the large paper, creating a parade. Have students write their own “how-to” pieces describing the steps they followed to create their own Jonkonnu figures. Continue to research Jonkonnu traditions in class. Using the class’s parade as inspiration and incorporating what they’ve learned about Jonkonnu, have students write a short historical fiction story. Connect this art activity to Black history during social studies. Formative Assessment: Students have followed directions to create a figure with emphasis on textile designs, have cleaned up scraps and materials/supplies properly, and contributed to the whole class “parade”. Displays can be made by the students in the hall helping to staple or tape large paper to the wall. Students can discuss what Jonkonnu is/was, can define a silhouette, and explain the choice of patterns they made. white construction paper, 6×9″; yellow board chalk; colored pencils; color sticks; markers; scissors; wall paper scraps; fabric scraps; glue sticks; black construction paper, 6×6”; kraft paper in a 10’ length onto which all silhouettes with costumes will be assembled and glued. 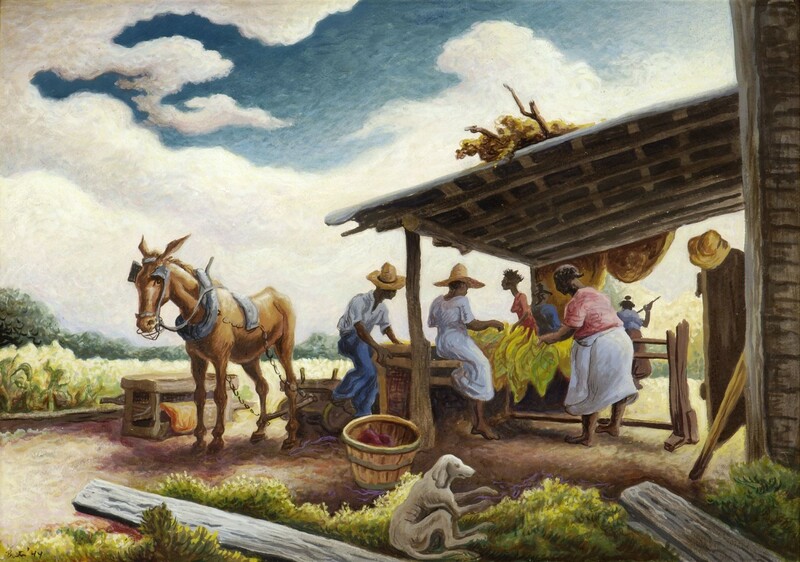 Thomas Hart Benton, First Crop, 1944. Gouache on paper, 21 x 29 3/4 inches (53.3 x 75.6 cm). Collection of the Nasher Museum of Art at Duke University, Durham, NC, USA. Bequest of Louise and Alvin Myerberg, 2010.3.1. ©T.H. Benton and R.P. Benton Testamentary Trusts / UMB Bank Trustee / Licensed by VAGA, New York, NY. Photo by Peter Paul Geoffrion.